In his first inaugural address in 2014, when Boston Mayor Marty Walsh laid out four pillars for his new administration, the final point was a pledge to “increase trust and transparency in city government.” Recent events surrounding the bidding process for Amazon’s second headquarters have brought this to life, suggesting that the City is capable of setting national standards for transparency and open government. The City proactively created a website, making all of the information about its response to the Amazon headquarters Request for Proposal public. This response to public requests for information about the bid stands in stark contrast to the enthusiastically-redacted documents that investigative journalists at MuckRock received about the incentives offered to Amazon by Montgomery County, Maryland (pictured below). Our team of five Harvard Kennedy School researchers is taking amazon.boston.gov as a model for what the City of Boston can do when it puts its policy, economic development, press and technology teams to work making government decisions understandable and accessible. We’ve spent two months interviewing people on both sides of the public records process in order to figure out how Boston can successfully live up to its own example across more than 70 City departments and agencies. To learn more about the process, we talked to experts nationwide. “The process of responding to public records requests is basically a black box to most people,” said Leah Bannon, formerly of 18F, a user-centric digital services firm inside the federal government. This comment echoes what we’ve heard from journalists, activists, researchers, and constituents nationwide. Agencies in charge of records requests often fail to communicate the reasons that certain requests require additional time, leaving requesters in the dark. “Maybe I didn’t structure my request very well and that’s why it’s taking so long?” said one journalist we interviewed. On top of that, requesters often aren’t given much information about the progress of their request. “Every so often, someone will write back to say they’re still looking,” the journalist added, referring to a particular request sent to the federal government agency. Many City of Boston departments have responded quickly to public requests. William Wang, a journalist for The Harvard Crimson, requested an incident report from the Boston Police Department and received it in just over an hour. Is this example an anomaly or a frequent occurrence? Unfortunately, until response times to public records requests are more thoroughly tracked and measured, we simply cannot know. “You can’t have accountability without measurement,” says Michael Morisy, co-founder of Muckrock and a public records expert. It’s not just requesters: City staff that act as custodians of records also suffer from an opaque and unmeasured process. Our research indicates that both requesters and City staff struggle with less common requests. Requesters are unaware of what records exist, how they’re stored or how to ask for them. Custodians are unaware of the precise intent of the request and may be limited by statute from asking certain questions in an attempt to gain clarity. A public records request can take a wide variety of routes, and make a large number of stops along the way. 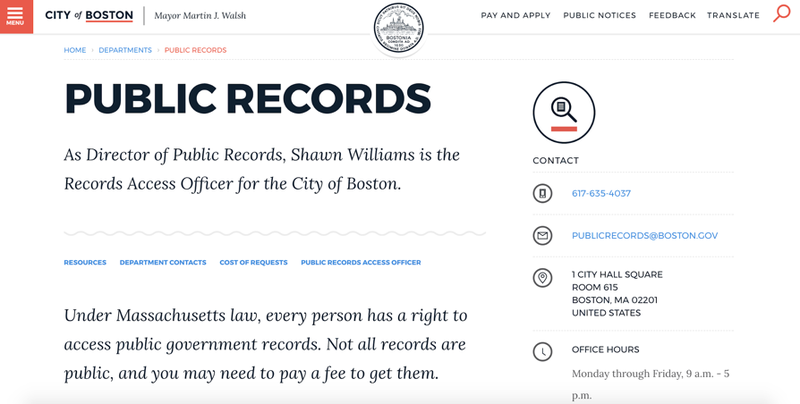 In particular, the City of Boston has more than 70 departments and 4 autonomous agencies that all maintain records subject to public request. The beginning of a public records search is familiar enough. “Almost all public records requests start with searching for the information in Google,” said Ms. Bannon, sharing a finding from 18F research for the recent foia.gov overhaul at the federal level. However, once your search engine of choice delivers you to an individual agency or government records portal, all bets are off. Current processes are highly decentralized and variable. Although helpful resources such as boston.gov/public-records are available, requesters often find a public email address without further guidance and begin the awkward process of writing a specific request for something that may or may not exist, or that might even be publicly available if they only knew where to look. Requesters bring expectations for high-quality services based on their favorite commercial/private-sector products, and while these can be difficult standards to meet, the differences can help clarify points of frustration for both requesters and custodians. “It would be nice to have a portal where you track your request, see where you are in the process, like we have for packages,” stated one interviewee. In other words, our team has discovered the importance of updating not just the technology used in this process, but our understanding of how knowledge can be created and maintained. Our research has given us insight into the challenge of navigating a complex information system without a map or the ability to learn from others’ experiences. It is a challenge that digital tools are only just now coming online to tackle. Here in Boston, we’re excited to continue to work with the City of Boston to figure out what technology and tools might help the City employee and public requester alike.